Another beer round. A selection of the beers I've consumed recently. These are picked more or less at random, so expect a selection of good, bad and indifferent. The Coach House Brew Co - Blueberry Classic Bitter. 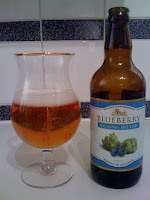 A 5 per cent classic pale ale, flavoured with fresh blueberries. Terrible. The pour is deep golden straw with a small, loose, white head. On the nose you get a mass of hard-boiled fruit sweets and Fruit Pastilles, but "fruit" is as accurate as you can get, there's no discernible single characteristic, it's just synthetic fruit. On the palate it really is bad, it tastes like someone's dropped a spoonful of Calpol in a pint of cheap bitter. I'd forgotten what Calpol tasted like, all those childhood memories came rushing back. One to avoid. 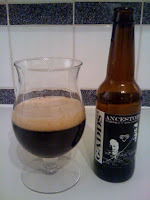 Gadds' - Ancestors Whiskey Cask Porter. A strong brown beer that's been aged in an Islay Whisky cask for fifty days. The colour is a deep black with hints of ruby around the edges, the head is loose and tan. On the nose you get some metal, some big roasty flavours and some subtle berry fruits. It starts with some malty sweetness and then gets picked up by the roasty malt, before huge earthy, smokey, burnt, whisky-tinged wood powers it's way in. In the finish you get some subtle bitterness that leaves a slightly tangy flavour. This is good, not exceptional, but good. I'm so glad people like Eddie Gadd are making beers like this in Kent, it's great to be able to buy them so close to home. This doesn't taste like the finished article yet, it's a bit raw and rough around the edges, the charred wood takes over a bit and it would probably benefit from some more of those lighter, vanilla, sweet whisky notes. A few generations on and this could be exceptional. Brewdog - Zeitgeist. Not a new beer, but one I haven't written about yet. This is Brewdog's attempt to make something that crosses over to the mainstream a bit more readily. A black lager at 4.9 per cent. Whenever I've had this beer, I've been in the mood for a black lager, and I've ended up disappointed. 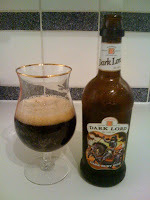 It pours an inky, oily black but the nose is all fruity American hops, not roasty dark malt. The taste is dry with no real sweetness, there's roastiness there but it comes mainly in the form of an overly bitter finish. For me this is either incredibly confused or just incorrectly labelled. There's too much bitterness and too much fruity hop for this to be a Black Lager. Maybe I'm putting too much emphasis on style, but you drink with your eyes in the same way as you eat with your eyes. When something misses like this does, it can be hard to adjust your palate. Batemans - Dark Lord. Another dark one to finish off. This one is 5 per cent and branded as a "Dark Ruby Beer". The nose is dark malts, giving roasty-coffee notes. Behind that you get some fleshy fruit aroma, maybe berries or even an over ripe banana. The palate delivers on the roasted malt in the aroma. Bitter chocolate and coffee sit next to some serious sweetness, perhaps even too much sweetness. The finish then reveals some subtle spicy hop, maybe the suggestion of some citrus and a peppery edge. This seems to sit somewhere between a stout and an old ale. I've had Adnams Old before and there are definitely some comparisons you could draw with this. I wouldn't rush out to buy this again, but it was enjoyable. Sounds like the Gadds is continuing to mellow. At first it was apparently like liquid TCP, when I had it last year it was still smoky and full of Islay flavour, now it seems a lot more dulled down. I do hope he brews it again as I loved it when I had it. And hopefully he'll put a couple of one-offs on for Planet Thanet - last year they had Pandemonium, which was Ancestors prior to the barrel-aging. 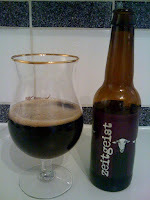 I like zeitgeist a lot and think it's one of Brewdog's best beers. Perhaps it helps to not think of it as a black lager and consider it a hoppy brown ale or something like that. Really, TCP? I definitely didn't get any of that in the bottle I had. Like I say, it tasted a bit rough around the edges, but shows a lot of promise. Apparently the one off for Planet Thanet this year is called Uberhop. It's a lager: bottom fermented, lager malts etc, but hopped to hell. I think he also said something about using noble hops in it. Sounds very interesting indeed ... if it's made quite near to the festival and dry hopped, I can imagine it smelling amazing! Wow, that would be something pretty special. I'll make sure to try it early on though as the Gadds beers disappear really quickly. And the Ancestors was HUGE Islay to begin, so really interesting that it's disappeared. Although... phenols are something which everyone detects differently, so I may be particularly acute at getting them whereas you may not be... who knows! Zeitgeist is a bit of a train wreck for me, I can't stand US citrussy hops and roasted malts together. The couple of times I've had it, I couldn't finish it. I've had Flying Dog Gonzo porter and I really really like it. That's full of roasty malt and American hop, but it seems to hang together a lot better at the higher ABV. I agree with you though, I don't think American hops have any place in a black lager and can't help but think the beer would be a lot better without them. I just get the feeling that it's Brewdog, they love American hops and heavily hopping their beers, so couldn't help themselves. @Mark - re Gadds - "At first it was apparently like liquid TCP"
Liquid TCP - So that would be TCP then?